For most of last year after playing Shadow of the Colossus there weren't really any games that captured my time as much as Nier:Automata and Persona 5. I spent a short bit of time here-and-there on sports games such as NBA2K, Madden and NBA2K Playground, but it wasn't until X-mas time that I got Dragon Quest XI. Now some 90 hours laters, I've reach the post-game portion of DQ. Dragon Question XI is a very pure JRPG. It sticks to the JRPG formula almost religiously. 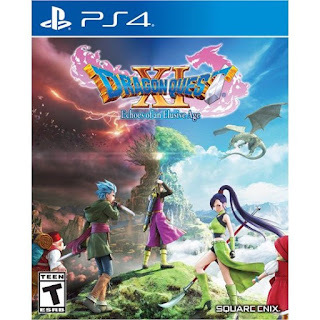 If you like classic JRPGs then DQXI is for you! If you don't like classic JRPGs then DQXI doesn't try to deviate in anyway to bring in new fans so you will probably still not like it with one exception. If what turned you off from JRPGs is the XP grind then fortunately DQXI doesn't require it. Just progressing through the game will generally keep you at the right levels and with just a little bit of time spent away from the main story line will get your characters to a level where the battles will be fairly easy to win. DQXI is a fun game. I didn't realize how much time was spent while I was playing. It wasn't that I was so focused and absorbed but rather that the game moves along at a fairly light and fast pace. I feel this was very intentional. It seems very deliberate by the developer to have you enjoy the game and not try to fight the game. Even the location of items (minus treasure chests) is available on the map so you don't have to search for them. This is a game that tries very hard not to frustrate players. The story is good and the characters are fine, but because of the way you interact with the other characters (which feels limited) I didn't feel as much of an attachment to them as I did to characters in Nier or Persona. The characters were more like chess pieces to be use in different configurations when going into battle. The graphics are nice and modern (in the sense that it's created for the current generation of consoles). I wish the main character would express more emotions because he felt kind of like a robot, and the music was not very inspiring (I turned the volume of the music pretty low). DQXI in Japan did not have any voice acting but they included the English dubs for the US release. I turned it off and just read the text and experienced the game as it would've been in Japan (Note: The japan release of DQXI on the Nintendo Switch will include Japanese voice acting.). These are fairly minor and obviously if I have spent over 90 hours playing it that I felt it is a good game and worth playing especially if you are a fan of classic style JRPGs.